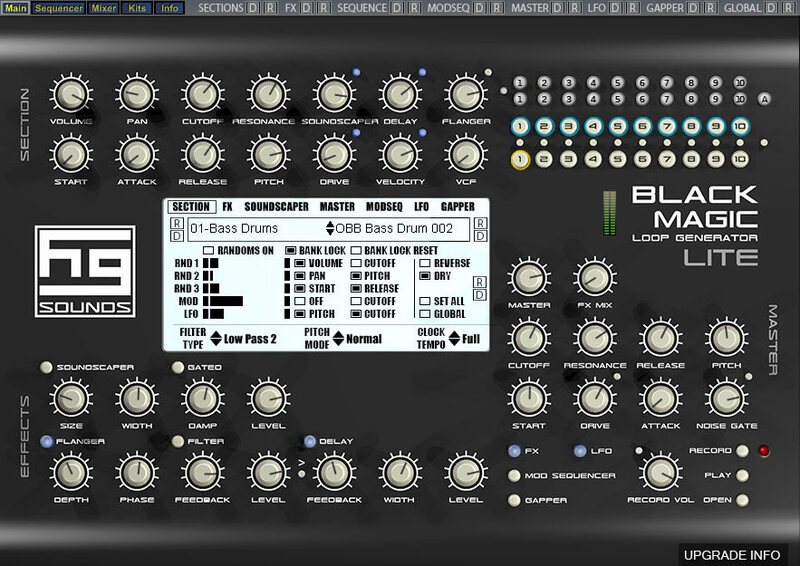 Black Magic Loop Generator / Black Magic Lite by Homegrown Sounds is a Virtual Instrument Audio Plugin. It functions as a VST Plugin. 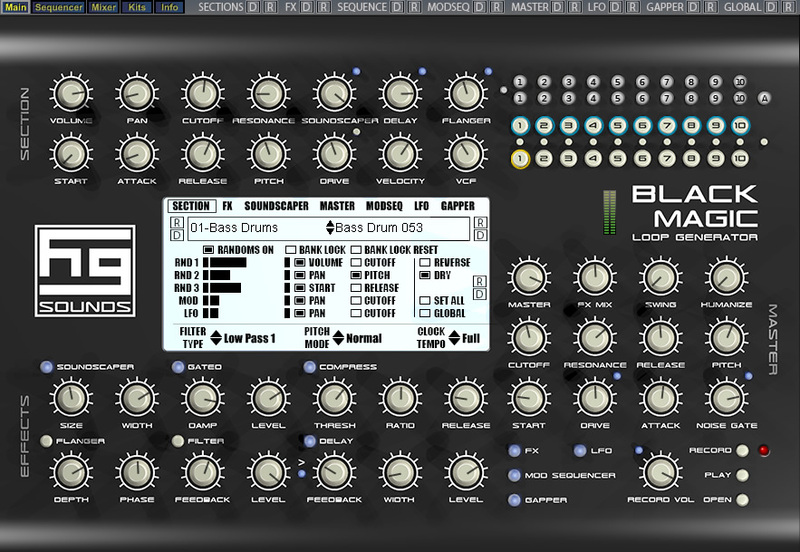 Black Magic is a unique loop workstation with the ability to generate diverse loops with a single mouse click. Furthermore a loop can instantly be recorded out to WAV, automatically named by BPM and timestamp. The idea developed to make sample based loops an easy and fun process, as loop creation is generally a time consuming process. Black Magic can also be used as a standard MIDI drum machine and also has the ability to jam with the individual sequences in real time. 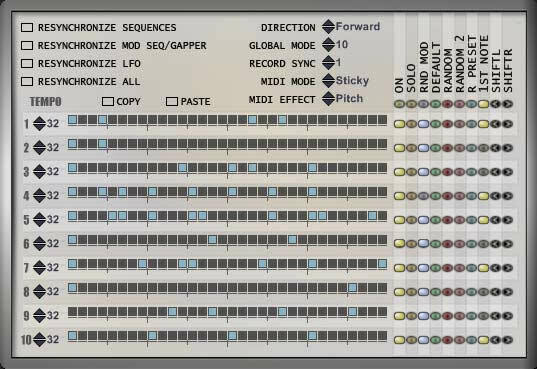 It has 10 Samplers each with its own sequencer and many adjustable parameters. 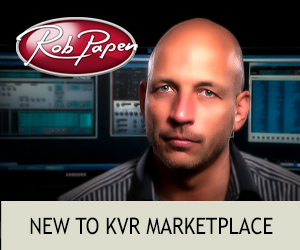 It uses standard WAV files and ships with a large library of samples, but users can easily add their own. 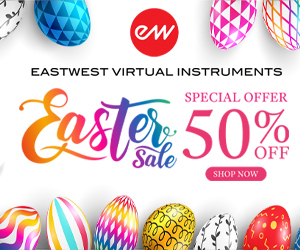 There is also an FX section which includes a Compressor/Limiter, Delay, SoundScaper, Flanger/Filter and Drive as well as many Modulation options including randomizers, a Modulation sequencer and an LFO. Black Magic looks deceptively simple on the surface and can be used easily without delving into the details too much, but underneath there is a vast amount of tweakable parameters. 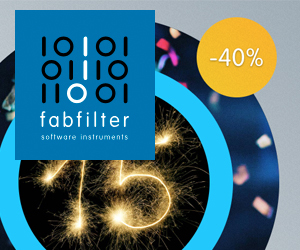 Each sampler has its own settings for 14 parameters such as Cutoff, Resonance, Volume, Pan, Pitch, Release, etc., but there are also a set of Master controls for these settings which are additive/subtractive. These knobs provide instant gratification and can change the sound dramatically as well as being automated (like most controls in BM). There is also an overview Mixer screen which allows seeing all levels for 12 of the Sampler parameters and allows a great way to randomize just the pitches or cutoff values for instance. Each Sampler has its own 32-step sequencer which can be triggered via MIDI and has adjustable step size, which allows for complex overlapping rhythms to be constructed. There is also a useful alternative to randomizing the sequence which uses a pre-defined set of presets which is randomly selected. This allows much more usable rhythms to be created as opposed to the standard randomizers (which are also available). Another useful feature is that Octave 4 and 5 of the MIDI controller affects a selectable parameter such as Master Pitch or Master Cutoff in real time which adds a whole new world of creative possibilities, for example playing a tune with the current loop. There is a Kit feature which allows grouping installed samples together and saving as a kit, this then allows quick selection of those samples in the future. The Kit screen provides a useful overview of all current samples where they can also be selected and randomized. Samples are stored in folders, and those folders appear as banks within Black Magic and there is the ability to lock the bank. 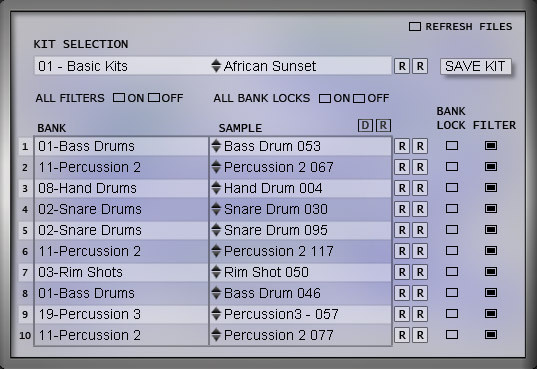 So, for example, selecting Snare drums and locking the bank will mean that when randomizing only Snare Drums will be selected for this sampler slot. The FX Section has Soundscaper which is a diverse delay/reverb style effect, a Stereo BPM Delay, and a Flanger which can be switched to Filter instead, the LFO has a large amount of wave shapes available. 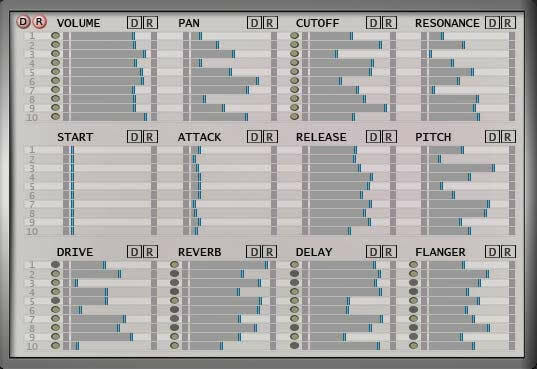 Each sampler has its own set of sends for these effects. There is also a Compressor, Limiter and Noise Gate which happen just before the Master Volume Level, the compressor is great for a heavy compression sound that is popular these days. Black Magic Lite is the free little sister of Black Magic. Even though Lite has fewer features than the big version, all of the important ones have been retained, so it is a fully functional synth in its own right. Upgrading to the big version, you will get a large collection of included samples, the ability to use your own and a hard compressor, amongst many other things. I bought BM a couple of month back in a special promotion and i don't think a day has passed since then that i haven't used it. I love it! Sorry but it has to said. For percussion tracks it's fantastic. The full version ships with a lot of sample content which i'm slowly working my way through but that's what the randomizers are for! But generally it's very good. It's actually a very mouse friendly plugin and as much a i try to avoid using the mouse this is one plugin where i enjoy it, BM feels like a natural extension. I think part of the reason is that small changes can achieve quite radical results. One of the other things that makes Bm unique imo is the master fx; you can set or disable the fx for each track independently and the master fx will affect each track relative to it's value so if drive is disabled on track one when you adjust the master drive control it will be unaffected but the tracks that have drive will be affected in varying amounts depending on the amount applied to each track so you will often get unexpected results and that's part of BMs appeal; it's unpredictable. It's also extremely light on the cpu considering all the fx and functionality it has built into it. The compressor is excellent for adding some punch to the drums and the soundscaper is great for adding some space and ambience. 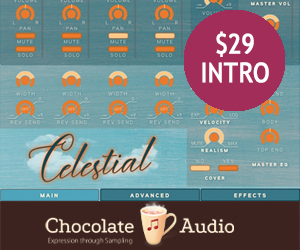 This is one plugin where the fx work really well on drums and percussive material. Then you also have a flanger,delay, mod sequencer, lfo, gapper and noise gate. Each of the fx have several functions and a randomizer. In fact just about everything has a randomizer! So again very easy to use with a mouse. Black Magic can be used in several different ways. The most interesting (so far!) is pitched mode where the samples can be pitched across two octaves. I tried this out with a bass drum and was able to create a really nice bass line. I then layered it with an sampled instrument on another track and it sounded great. It would be great if you could disable the pitch mode on certain tracks so that hihats etc weren't affected by the changes in pitch. You can also improvise live with it triggering the tracks via keys and record the output via midi or audio or you can play it as a kit like a standard drum sampler. It's very 'playable' and very much an instrument in it's own right. I should qualify this review by mentioning that I was on the Beta team for Black Magic and, for this reason, my 5 ratings in 'value for money' and 'documentation' categories should be taken as neutral. Loop creation with BM is very quick and easy to grasp and with the randomization features you can generate a huge variety of loops with zero effort. The randomization itself can be as specfic (just one sequence for example) or as global (essentially generating a whole new loop) as the user wishes.. Maybe you like everything except the bongo that is coming every quarter note.. you can randomize just that sample until you find something you like better or randomize the bongo's sequence until it fits into the groove a little better or just throw a little delay on the bongo..multiply this by 10 (each sequence\sample is its own "module") and then again by the sheer number of tweakable paramters and effects and it becomes apparent that the possibilities are literally infinite. Conversely, if you want to completely construct your loop from scratch with control over every step, this kind of control is available too. Once you find that perfect groove, it's time to capture it. 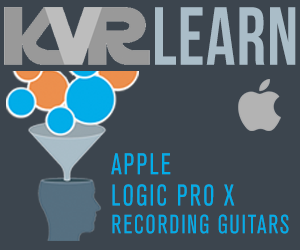 Since the loops are recorded by the VST itself, there is no setup (ie rendering or using an audio capture vst) other than specifying the length and bit rate; BM automatically records the entire loop from the beginning of the sequence for a perfect loop every time. No need to search for the loop afterwards: you can play it back from inside the vst and there is a button which opens up the folder where the loop was stored (with unique name\timestamp and organized by tempo!) 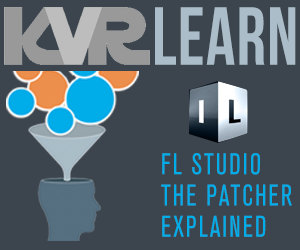 and I've just been dragging the wavs from that window into the DAW timeline or even right into other vsts (in my case Linplug's RMV) and messing further with them there (slicing etc). You can also engage the record function in a manual way with the B5 key while the loop is playing. You can have live control of each of the 10 sequences.. you can play each sample as a one shot (in the C2-A#2 range), or hold a key down to trigger and loop the sequences until release(C3-B3 with B3 being all 10 on at once).. this mode can also be set to "sticky" so the keys toggle on and off with each press. Sticky mode is a dream if you like to build up a groove gradually by bringing different elements in and out with the additional perk of being able to throw in a roll or polyrhythm by hand on the lower octave. If you play keys higher up the keyboard you can manipulate the pitch (or res\cutoff among other things) while the loop is playing for a lot of interesting variations. In addition to hundreds of percussive samples included (in the full version) there are some 'instrumental' samples which respond to this pitch manipulation rather well (although there is also something to be said for playing a melody with a snare drum). You can use your own wav files with the full version to add even more expandability. All of the above can also be recorded as midi performance data for further tweaking later. So whether jamming live or creating loops, the midi control aspect is integral to the experience. Andy at HG Sounds is a top-notch guy and his response to suggestions and critiques during the beta-phase was quick and effective. I can safely say this is even more apparent in his relationship with his customers (which I also am). There are some issues with sluggish knobs and rendering in Tracktion 3 but these have been mentioned prominently in the information pages of the website and do not affect the stability in any way. It worked fine for me in Reaper and Minihost. I personally don't think it would be the best choice for those looking to make realistic acoustic drum loops but would be very useful for any electronic genre. It lacks midi output (afaik) and doesn't load audio loops, so it is kind of sitting right in the niche between the other percussion\drum products I've used, while not actually replacing any of them. The GUI can at first be a little daunting and the hardware emulation esthetic makes for a bit of flipping around but once you realize where things are, the why becomes more apparent. Swapping kits and samples is easy and quick, the mixer page allows fine control over important parameters for each of the 10 samples, and the seqeuncer page has a step-sequncer grid for each of the 10 sample modules with many options for tempo, length, soloing etc. Black Magic is a really unique approach to rhythm and while it may share some characteristics with other "drum" vsts, I can't think of one that really does what it does. It is awesome for creating mountains of loops to feed into other apps (for slicing etc) while at the same time functioning as a highly controllable live drum machine\groovebox. BlackMagic’s interface is simple on the surface, and optionally complex as needed. This approach allows users that are solely interested in using the many presets, or users solely interested in using the randomization options, to remain focused on creating rhythms quickly or allows user interested in maximum tweakability, full control in cusomization. Moving deeper into BlackMagic unfolds the various sections for Sequencing, Mixing, saving/loading Kits, and sections for FX, Soundscaper, Modulation, Sequencing, LFO and more. Most of all these sections have their own randomizing options, at every step of programming you can control just how much randomization you want or if you want it at all. BlackMagic comes with over 1000 samples to use, but one of the best features of BlackMagic is that the sound library is completely expandable, allowing users to use their existing sound libraries (not available in the Lite version). The samples can either be triggered by sequencing them, or they can be played through a midi-controller. The sequences can also be triggered by midi-controller or by mouse (either individual instrument sequences or all 10 at once). This has a number of built in features such as Filter, Delay, Reverb, Phase, Drive (distortion), Compression and a Limiter. This has pitch control, which can either be controlled by one of the knobs on the interface or can be controlled through a midi-controller, by playing the keys of a keyboard raising in semitone per each key. This also has a humanization control and swing control, as option incase the user doesn’t want that heavily syncopated sounds often associated with drum machines. Manual and support are available easily through the BlackMagic device. Clicking on the Info section offers direct links to both the manual and to the hgsounds website. This is an extremely stable build. Having participated in beta testing, I’ve had considerable time to break this in any way possible, but even the last beta releases were also extremely stable. Multiple instances are not a problem and general CPU consumption is low, even on my modest setup. It is important to note that because of the pitch control options, and the pitch control via the keyboard… BlackMagic should not be thought of as being limited to a drum machine. This can easily allow a user to create any number of possibilities beyond that. Lastly, one other strength/feature is that BlackMagic has a record option built in which allows a user to record the sequenced rhythm and when saved, it will automatically be named along with the BPM that it was recorded in. 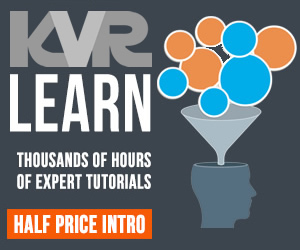 This quickly reduces time for all who record loops to use at a later time.